Kerry & Wayne’ wedding was certainly a day to remember. They well and truly spoilt their friends and family. The wedding took place at the Shottle Hall in Derbyshire, an exclusive country house wedding venue located in the heart of the Peak District. The views of the rolling fields surrounding the venue are simply spectacular. The venue has spacious and beautifully decorated reception room full of natural light. Definitely every wedding photographers dream come true! If you are stuck for ideas for your own wedding, keep scrolling down. Kerry and Wayne had a few things planned for the day. 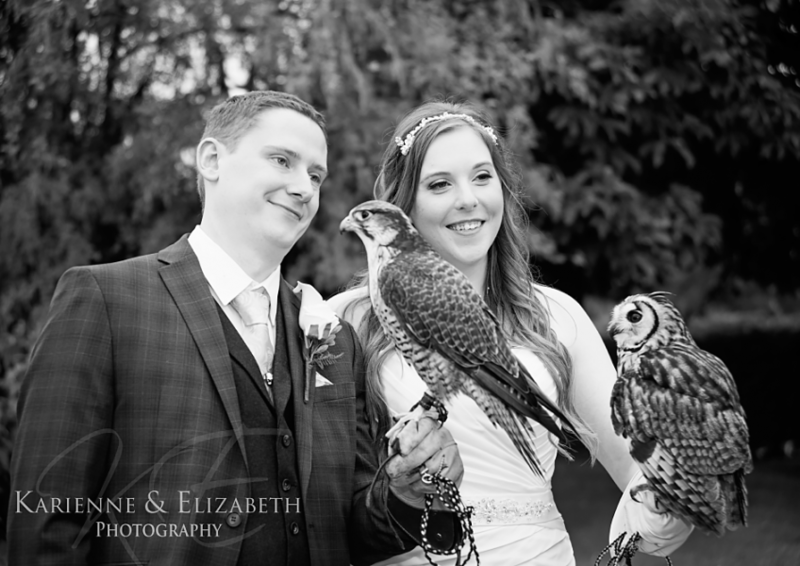 The wedding falconry display was a lovely way to spend the period between the end of the reception and start of the evening entertainment. All the guests to came together during this happy time to watch and take part in a falconry display which was also a great opportunity for us to take a lot of relaxed photographs. We are often asked which wedding suppliers we would recommend. Here is a list of awesome people located in the Derbyshire area and they all did an amazing job at Kerry & Wayne's wedding day. If you would like to book us for your wedding in 2019 or 2020 contact us for no obligation meeting...We can have a chat over a hot drink, look through our wedding album samples and see whether we could be the perfect photographers for your perfect day. To see Kerry & Wayne’s beautiful engagement session at the Shottle Hall, click here.